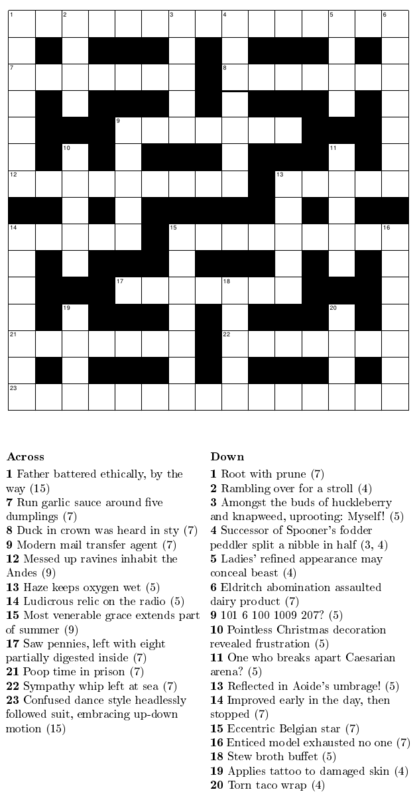 I am indebted to Thore Husfeldt for introducing me to cryptic crosswords in the first place. To my knowledge, this puzzle tradition is fairly unknown outside the English-speaking part of the world. This is presumably because the English language lends itself particularly well to the kind of wordplay employed in cryptic clues. And so, growing up in Sweden, I never quite understood why some characters in translated English works of fiction were so obsessed with crosswords. Now I know. Enjoy, and beware of spoilers in the comments!